How Much Compensation For A Death Caused By A Fatal Motorcycle Accident? In the UK, motorcyclists are often involved in fatal motorcycle accidents due to the physical vulnerability and lack of protection of motorcycles when compared to cars or larger vehicles. When two motorcycles collide – or one motorcycle collides with a car or lorry – the consequences are usually fatal for the motorcyclists. Even motorcyclists equipped with helmets have also succumbed to severe head injuries caused by road accidents. As such, motorcycle accidents can easily result in casualties or fatal injuries. UK traffic research states that a motorcyclist is roughly 40 times more likely to be killed in a road accident than a vehicle driver or passenger. Even when such tragic accidents are not fatal, the motorcyclist may be fighting for their life through life support systems. Motorcyclists who suffer severe injuries or death as a result of an accident may have a right to legal compensation. If the motorcyclist is also partially responsible for the accident, British Law may grant partial compensation, based on the role played by the motorcyclist in “contributory negligence.” The loss of income and quality of life can leave the motorcyclist and close family members devastated. This guide is designed to help those families in need of legal support. 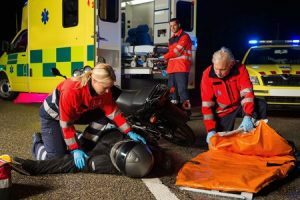 This guide discusses the different causes and types of motorcycle accidents, the types of claims associated with each type of motorcycle accident and the legal procedures related to fatal motorcycle accident claims. After reading this document, if you feel you need to contact us for proper legal guidance, use our contact information provided at the bottom of this page. A guide to claiming for death or severe injuries caused by a fatal motorcycle accident. What is a fatal motorcycle accident? Claiming for a fatal motorcycle accident caused by driver negligence. Claiming for a fatal motorcycle accident caused by a distracted driver. Claiming for a fatal motorcycle accident caused by speeding. Claiming for a fatal motorcycle accident caused by intoxication. Other common causes of fatal motorcycle accidents. Claiming for a fatal motorcycle accident that happened at work. Claiming for a fatal motorcycle accident in a public place. Fatal motorcycle accident facts and statistics. Who can claim for a fatal motorcycle accident? What to do if you have lost a loved one due to a fatal motorcycle accident? What can be claimed for after a fatal motorcycle accident? No win no fee fatal motorcycle accident claims. How much can I claim for a fatal motorcycle accident? 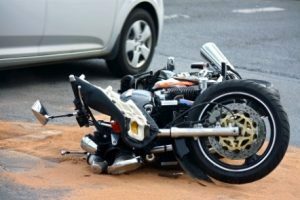 How to start a fatal motorcycle accident claim? Why choose us as your claims service for a fatal motorcycle accident claim? Generally, a motorcyclist on UK roads (especially in urban areas) is susceptible to several factors which can lead to fatal accidents. Those factors include speeding, acceleration rates, lack of stability, lack of protection and relatively “insignificant presence” compared to larger vehicles on the road. Thus, when motorcyclists collide head on with other motorcycles, vehicles, or obstructions, the consequence is often fatal injury or death for the motorcyclist. Many motorcycle compensation stories contain gruesome details and promise high compensation payouts but, in reality, no law firm can discuss possible payouts without analysing the actual details of your case. As mentioned above, most of the road accidents involving one motorcycle and other traffic result in the motorcycle passenger dead or suffering severe injuries. In most cases, the motorcycle accidents are caused by limited viewing ability, a sudden turn, lane splitting, drunk driving, speeding, lack of driving experience or violation of traffic laws. In very unfortunate situations, motorcyclists may end up in road accidents through no fault of their own but instead due to broken pavements, debris or potholes. This situation is even worse because it not only leaves the motorcyclist dead or fatally injured, it may also cause significant damage to other property at the accident site. Motorcycle accidents caused by negligent drivers are typically viewed as criminal offences under UK Law. A negligent vehicle or motorcycle driver, if alive, may be tried in a criminal case for violating the duty of care that he or she owes to fellow road users. A negligent driver is also considered as a dangerous driver who has the potential to harm other road users. When driving without due diligence causes death or severe injuries – like head, back, or neck injuries – then the victim’s family members may have a legal claim to just compensation for the permanent damages suffered by the victim. In dangerous driving situations involving drunk driving, speeding, racing or violation of traffic laws, the police will investigate the matter and provide sufficient evidence to pursue a legal proceeding against the guilty parties. In this scenario, the errant driver’s negligent behaviour will have to be proved to get compensation. While representative motorcycle accident compensation amounts have been provided in a later section, it should be highlighted that the success of a compensation claims case depends on many different factors. In modern society, vehicles are often equipped with many distracting gadgets that are likely to cause road accidents. Under UK law, careless or reckless driving resulting from a mobile phone, loud music or racing accessories can be considered distracted driving. Driving while distracted can cause accidents, which in turn can leave a motorcyclist dead or injured. In such cases, the victim’s family can claim compensation for future maintenance and support of the victim and his dependents. In this case, the UK Police can provide the necessary evidence to pursue a legal claims case and possibly an insurance claims case if one is applicable. In the case of speeding resulting in a motorcycle accident, the dead or injured motorcyclist or their family must initiate the compensation claim within three years of the date of the incident. In other words, a statute of limitations applies to this three-year period and, barring unusual circumstances, the victim may not be able to file for compensation after this time has passed. In such a case, the victim will need to prove beyond reasonable doubt that the injury happened as a result of the speeding accident and that the defendant was directly responsible for the accident. Intoxication or driving under the influence of alcohol is a serious offence in the UK. If motorcyclists sustain life-threatening injuries or succumb to death due to driving while impaired, such accident cases are likely to reach the courtrooms. Generally, injuries sustained in this type of accident are fatal and can cause brain malfunction, severe neck pain or permanent back injuries. The victim, with the help of police files and proper legal guidance, will have to prove criminal negligence on the part of the guilty driver. If you are facing such a situation, get in touch with us by using the contact information provided at the bottom of this page. Spillages on roads leading to slips or falls. Hit and run accidents, where an uninsured driver chooses to flee the scene of an accident. Faulty and badly maintained motorcycles. Lack of proper protective clothing for the motorcyclists. Bad weather conditions leading to poor visibility and slippery roads. Any one of the above issues or a combination of the issues can lead to a fatal motorcycle accident. If any of the aforementioned motorcycle accidents happen to a UK resident whilst they are working, that accident may be deemed as a work-related incident. Many people in the UK have to regularly travel to their day jobs, thus increasing the probabilities of them being hurt in a road accident. When motorcyclists carrying out their work duties meet with fatal road accidents, they may be able to claim compensation from their employers, their employer’s insurance company and their own insurance company if the law permits it. Accidents which occur in a public place may need to be addressed in a different manner. There are a number of laws and regulations which dictate the way in which public places must be kept and maintained. This is true for both private owners and local governments. The occupier of a property – be it the council or the renter of a shop space – has a duty to provide a reasonable degree of safety. This also applies to public spaces such as car parks, places in which a fatal motorcycle accident might occur. If you would like to learn more about how to file a compensation claim in these circumstances, call our team now and discuss the matter. Motorcycles constitute only 1% of road traffic but account for 19% of all road accident casualties. Motorcyclists are 38 or even 40 times more likely to succumb to road accidents, compared to other vehicle drivers and passengers. In 2013, Great Britain road accident statistics included 331 dead and 4,866 injured motorcyclists. On average, 30 motorcyclists are killed or injured at road junctions each day. If you would like to learn more about making a compensation claim in the wake of an accident, call our offices and arrange a free consultation session. Financial Dependents – Any person who was financially dependent on the victim, which may include spouses, children or partners. Family Members – Any member of the family who, while not financially dependent on the deceased, still suffered emotional trauma due to the loss. Estates – Parties that have suffered due to death can also be the part of a claim via the deceased’s estate. When considering motorbike accident compensation how much you receive will likely depend on your relationship to the deceased, as well as a number of other factors which we will cover in a later section. Gather together any legal documentation for both deceased and surviving parties who were involved in the accident. If necessary, we are able to arrange for a visit to a local doctor. Gather together any additional evidence, such as photographs of the scene of the accident, police reports, and photographs of the vehicles involved. Organise all financial documents (such as bills and receipts) related to the accident in order to calculate your total financial losses. If you are unable to complete these steps by yourself, designate a reliable person to complete them on your behalf. The amount of compensation you may be eligible to receive may depend on a number of factors, such as the extent of negligence, the extent and severity of damages, your age, and the number of dependents involved in the case. The following list includes common types of damages that you can claim, though every item listed here may not be applicable in your case. Special damages, which may include lost income and projected future expenses due to loss of earning abilities. Medical expenses, which may include all medical expenses and aftercare costs. Travel expenses, which may include all transportation costs for travelling between the accident site and the victim’s home, between the law office and the victim’s home, and all other trips related to the fatal motorcycle accident. When pursuing compensation, it can help to have the assistance of a legal expert. Our solicitors, for example, can help ensure that you are claiming for all of the relevant costs, damages and expenses as they pertain to your case. To provide a compassionate legal environment and maximum financial relief to our clients, we offer a Conditional Fee Agreement (CFA) deal. This means that you do not need to pay us until you are financially compensated. This ‘No Win No Fee’ approach protects you from costly legal fees while affording you top quality legal representation at the same time. This client-friendly approach makes it easy for clients to approach us for expert legal help without the risk of large bills should their claim not be successful. We can provide motorcycle accident compensation examples and help you discover how a ‘No Win No Fee’ approach can be the best approach for your claim. Many factors come into play in a compensation claims case related to fatal motorcycle accidents. These factors include the victim’s age, the extent of recklessness or negligence on the part of the defendant, the extent and severity of physical damages of the victim and the number of dependents involved in the claim. In some cases, the circumstances of the accident may play an additional role in the case. While there is no definitive average compensation for motorcycle accident, the actual merits of an individual case play a large role in an accurate estimate of compensation payouts. The pay table provided here is only indicative of some common motorcycle injury claim examples. Note: prices marked with * are baseline prices, and will typical have additional forms of damages added as part of a claim. Death £12,500 - £300,000 A basic amount for general death. Minor Anguish £8,000 - £10,650* Death after unconsciousness with limited awareness. Moderate Anguish £1,050 - £2,125* Death after total unconsciousness within a period of one week from the initial injury. Severe Anguish £6,400* Death after total unconsciousness within a period of six weeks from the initial injury. Very Severe Anguish £15,950 - £18,100* Death after total awareness from the initial injury. Mental Trauma £3,550 Intrinsically linked to severe death; the emotional pain caused by awareness of oncoming mortality. Funeral costs £3,000 - £10,000 The costs of the funeral, including ceremony and burial. Punitive damages £1,000 - £275,000 Damages awarded for punishment of the defendant if behaviour is particularly egregious. Pain and suffering £1,000 - £200,000 Emotional/physical pain endured by both the deceased and their survivors. Loss of benefits £5,000 - £500,000 The loss of benefits of the survivors of the deceased. Loss of anticipated earnings £10,000 - £400,000 Loss of potential future earnings, particularly if in the near future and easily measurable. Loss of care, protection and companionship for family members. £2,000 - £100,000 An extension of emotional suffering, particularly dealing with family. If you find that your health condition is not mentioned in the table, we can provide you with a more specific motorbike accident compensation calculator in our free consultation session. Following a fatal motorcycle accident, you may be struggling to figure out where to begin with your claim. At an already difficult time, trying to find the right information can be incredibly hard. That’s why we always recommend that potential clients look into the possibility of hiring a Claims Service. If you call our offices, for example, we can arrange for you to enjoy a free consultancy session. In this session, we will go over the case with you and help figure out the likelihood of it being successful, the potential settlement you might receive and the best way to move the case forward. Following this session, if you decide to work with us, we can take over the majority of the case and act on your behalf. If you’re wondering about where to start with your claim, one call to our company can be the best possible move. Deep knowledge of all types of personal injury laws. Completely free legal consultation and expert legal representation. ‘No Win No Fee’ agreement; you pay only if you get compensated. The ability to arrange for a local medical appointment as part of the claim. If you are looking for a trustworthy law firm, look no further. Call our offices today and discover what we can do to help you. If you are considering a claim for compensation for fatal motorcycle accident, our team are ready to help you. We have the legal know-how and a huge amount of experience; everything you need to prepare a game plan for winning your case. Call 0800 073 8804 for a free consultation. Alternatively, you can fill out a contact form or use the chat feature on our website to arrange a consultancy session at the best time for you. Fatal Accidents and Death Compensation Claim Amounts. Find out the full amounts you can claim for death compensation if a family member or loved one has had a fatal motorcycle accident. We also offer free advice on the phone or our online chat contact us today. This NHS link has useful information on how to cope after the death of a family member or loved one. Check out this Citizens Advice link on what to do after a death it has some useful information. If a family member or loved one has had a fatal accident due to a motorcycle road accident contact us for free advice and find out if you can claim compensation. Cycle Accident Claims and How Much Compensation you can get. More and more people in the UK are using cycles however the road can be a dangerous place and as a result many cyclists die on the road through no fault of their own if you have lost a family member or loved one due to a cycle accident contact us today. Many motorcyclists are struck by cars, car accidents are responsible for many motorcycle accidents each year contact us for free advice on claiming compensation.